One in four smokers dies early because of smoking. Smokers die of heart disease, stroke, cancer and emphysema. What’s more, research shows that secondhand smoke, the smoke from other people’s cigarettes, can cause harm to the health of nonsmokers. Cigarettes are very addictive and cause sickness and poor health. 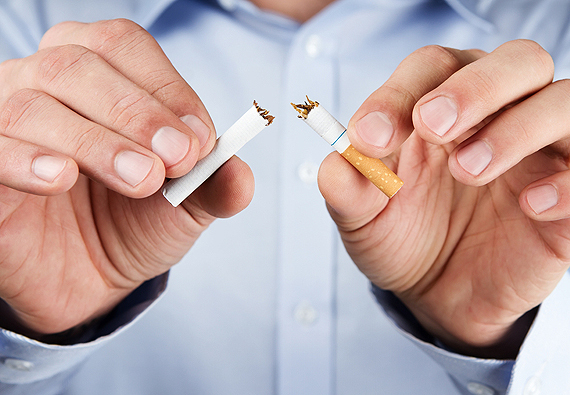 If you have tried to quit smoking, you know how hard it can be. Quitting is hard because nicotine is a very addictive drug. For some people, nicotine can be as addictive as heroin or cocaine. Some people try two or three times or more, before finally being able to quit. Each time you try to quit, you can learn about what helps and what hurts. Quitting takes hard work and a lot of effort, but you can quit smoking. Illinois Tobacco Quit Line provides a staff of nurses and certified tobacco counselors who offer you FREE advice, addiction help, your own quit plan, cravings support, follow up, and more. The vast majority of smokers begin tobacco use before the age of 20, with surveys indicating first use occurring most frequently at age 12. Here at the Mason County Health Department our goal is to help prevent tobacco use among our young people, provide support for smokers who want to quit, and provide a healthier environment for our community, by eliminating second hand smoke environments. In January of 2008 Illinois adopted The Smoke Free Illinois Act (410 ILCS 82; Public Act 095-0017) is a comprehensive anti-smoking law (2008-01-01), and bans smoking in most buildings and vehicles used by the general public, used as a place of employment, or owned by the government or other public body. It also requires “no-smoking” signs, bans smoking within 15 feet (4.6 m) of openings in the targeted buildings, and requires at least 75% of rooms in each hotel to be non-smoking. It replaced the more limited Illinois Clean Indoor Air Act (410 ILCS 80). You can contact Melissa Shaw, our Environmental Health Inspector & Public Health Nurse and our Smoke Free Illinois Coordinator at 309-210-0110 ext. 228 or mshaw@mchd.onmicrosoft.com.